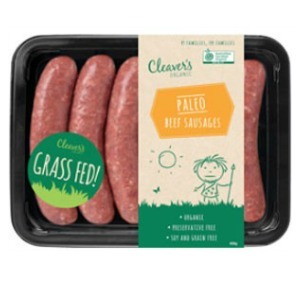 Cleaver’s paleo meats have been created in conjunction with celebrity chef and paleo diet advocate, Pete Evans. 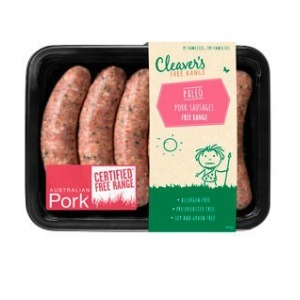 Cleaver’s has extended its range of healthy options available for anyone following a Paleo diet or simply looking for an allergen free product. All the meat is either Organic Free Range or Free Range and all of the vegetables and seasonings are Organic. Organic Beef Sausage – prime organic grass fed beef with add onions added which have been sautéed in rich organic grass fed beef tallow. Sweet organic carrots and organic garlic are added for further flavour, before the sausages are lightly seasoned with organic pepper and Australian sea salt. Organic Honey Beef Chipolatas – prime organic beef with sautéed onions, sweet organic carrots and organic honey added for flavour. The chipolatas are lightly seasoned with organic pepper and Australian sea salt. 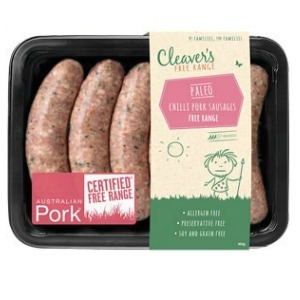 Chilli Pork Sausages (free range) – prime free range pork with sautéed onions, sweet organic carrots and organic garlic added for further flavour. The sausages are lightly seasoned with organic pepper and Australian sea salt before a being finished with a dash of hot chilli. 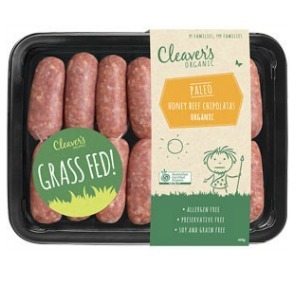 Pork Sausages (free range) – prime free range pork with onions added, which have been sautéed in rich organic grass fed beef tallow. Sweet organic carrots, organic garlic are added for further flavour, before the sausages are lightly seasoned with organic parsley, organic pepper and Australian sea salt. 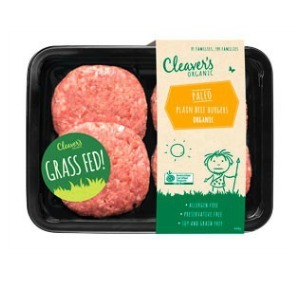 Organic Beef Burgers – prime organic grass fed beef with onions added, which have been sautéed in rich organic grass fed beef tallow. Sweet organic carrots and organic garlic are added for further flavour, before the burgers are lightly seasoned with organic pepper and Australian sea salt. 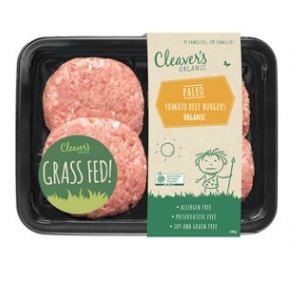 Organic Tomato Beef Burgers – prime organic beef with sautéed onions, sweet organic carrots, organic garlic and organic tomato paste added for flavour. The burgers are then lightly seasoned with organic pepper and Australian sea salt.